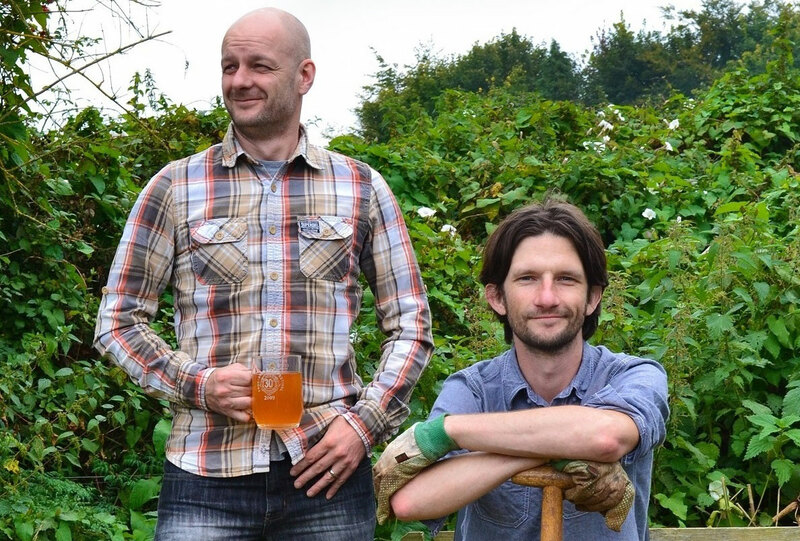 A few weeks after acquiring our allotment back in 2011, we planted four apple trees with the purpose of producing cider. Two of the trees (Fair Maid of Devon and Harry Masters Jersey) have grown up to become magnificent, apple-bearing specimens from which we have made many a pint of dangerously strong booze. One of the weedier trees (Brown’s Apple) after a year of poor performance, mysteriously snapped at the base one night* and has since been consumed by Rich’s wood burning stove. Our other original tree – the Kingston Black – has unfortunately suffered from the gusts of winds that rip through our exposed allotment site and has subsequently developed an unfortunate lean. When planting a tree, there are a couple of different schools of thought when it comes to staking and tree support. Some say that staking provides the tree with support until its anchor roots develop. Others claim that the to-and-fro motion of a free swaying, unstaked tree will strengthen the roots, leading to a sturdy tree. We went for the tough love approach, forgoing the stake because a) we were in a rush to plant the trees and b) we forgot to buy stakes. 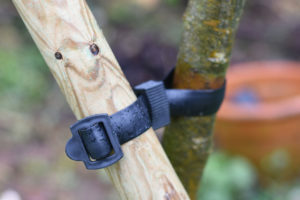 This technique worked well for our other apple trees we planted, but the windy conditions up at the plot proved a bit too much for our beloved Kingston Black. First off, we’re going to guide rope the tree. Guiding is the easiest, most secure way to offer support to trees that are already established – just the ticket then for our wonky tree. Staking alone might be enough to rectify the problem, but we are going for a ‘belt and braces’ approach. Choose your rope. You want to use something at least 4mm thick that doesn’t stretch under duress. Cut a 30cm length of old hose and thread your guide rope through the middle. (Or slice open the side of the pipe and retro-fit it if you forget. 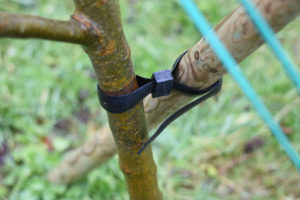 Like us) This will prevent the rope biting into the tree and damaging the bark. Wrap your rope around the trunk and fix it to the ground with a sturdy peg. You’ll want to peg it out at a distance of at least four foot from the base of the trunk for maximum stability. Be aware of the trip risk you are creating, so try to use a bright coloured guide rope to head off any potential accidents. There are various methods of staking a tree, but because we want to avoid damaging the established roots, we’ll be using the angled stake method. 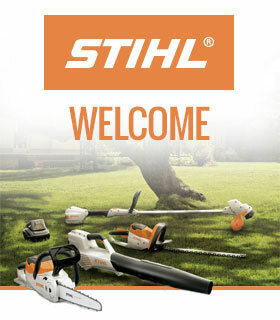 Inspect the stake for knots and cracks before purchase. Any faults will be magnified when you hammer it into the ground, especially if the earth is frozen or rocky. 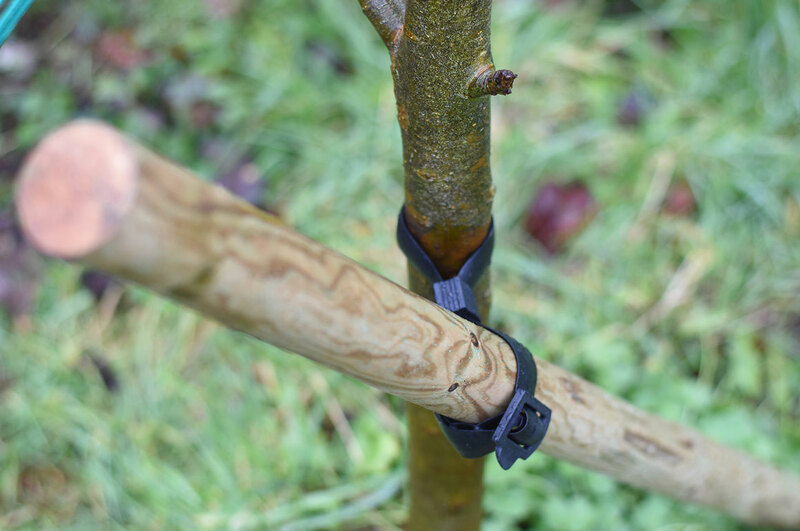 Secure the tree to the stake with a soft, rubber tree tie. Remember that ties need to be loose enough to allow for growth, so make sure you go for one that you can adjust easily. We plan to leave the stake and guide in for at least one growing season, by which time we expect the roots to have spread sufficiently to enable the tree to stand upright without our woody/ropey additions and be as magnificent as the others! Have you ever tried supporting a tree in this way before? Or do you have your own suggestions for making sure a tree is sturdy and straight? We’d love to hear your ideas – leave a comment below.